When the Four Horsemen launched their Kickstarter, they had six birds ready to go - the rest were left to be stretch goals. Appropriately, the first one to be unlocked was the only one who's also a named character in the story: Decimus' brother, Nonus Hrabban. 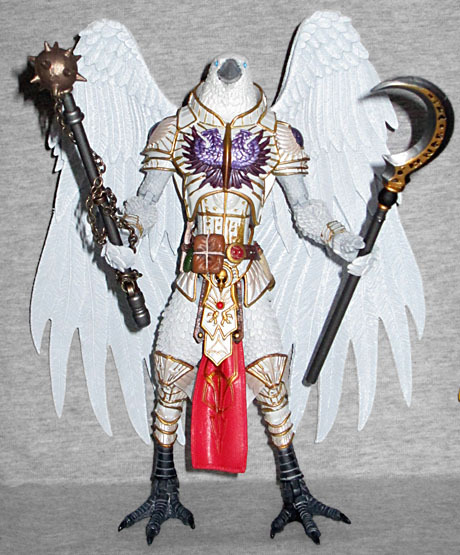 Originally billed as "the White Raven," Nonus definitely lives up to that moniker: the only difference between him and the normal figure is the paint. He's white with bright blue eyes, and his armor is white with gold outlines and purple details. His loincloth is red, and his feet are grey - all three sets, just like his bro. He even has the same ornate weapon, rather than the simplified version as the other birds. You can buy a set of white wings to go on his back (shown above), and there's also a "White Raven Battle Pack" that features an alternate head with open beak, a winged helmet colored to match the rest of his armor, and a fancy sword. "Hraban" (with one B) means "raven" in German. And if you recognize the pattern started by Decimus and Nonus, then you can probably figure out that they've got a bunch more siblings named Octavius, Septimus, Sextus, Quintus, and so on. By himself, Nonus isn't that impressive a design, but putting the white raven with the black raven makes for a very nice contrast.